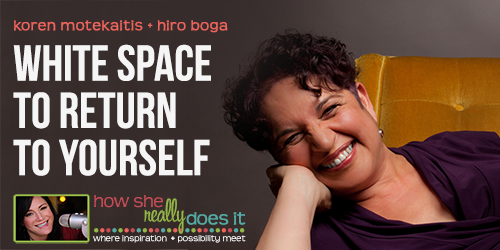 Hiro Boga is a business strategist, teacher, adviser and mentor. This is the second of 8 shows Hiro is joining us on How She Really Does It. 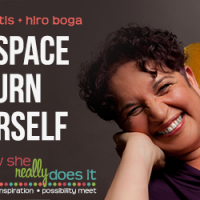 In this conversation Hiro and I discuss white space as a place to return to yourself. How we discover who we are…. Hiro Boga on HSRDI Creating a relationship with yourself. Click “view in iTunes button > Launch iTunes application > Click Write a Review. Your review helps spread the word about the show + is always appreciated by me. Thanks for listening to How She Really Does It, the place where inspiration + possibility meet. I so appreciate your emails about the show + it’s impact on your life. I look forward to serving you with this show! Thank you Hiro for joining us this week. Until next time, I am smiling big for you!